HomeHow much does a yard cost in the NFL? I plotted rushing yards for each running back during the regular NFL season of 2014 and their respective average yearly salary (the total contracted amount divided by contract duration). The result shows an expected positive correlation: the more money spent on running back salaries the more rushing yards a team is expected to gain. Running backs perceived as “good” tend to get more money, right? However this is not true for every team when we look at the big picture. In the plot, I included the sum of yards and salaries for each team but only for players who had at least 30 rushing attempts during the regular season. This condition excludes players affected by injuries early in the season and Adrian Peterson from the Minnesota Vikings, who has a contract valued at 14 million dollars per year but only played 1 game in the 2014 regular season due to legal issues. In 2014 regular season, the Dallas Cowboys had the most rushing yards: 2,722. The Cowboys also spend about 10 million dollars in running backs salaries alone making each yard cost $3,705. Dallas numbers were largely driven by DeMarco Murray who had 1,845 rushing yards alone. The Seattle Seahawks had the higher spend in the NFL (13.5 million dollars) but the number of yards was a little below expectations: 1,791. For that amount of money, considering all other teams, the Seahawks were expected to conquer 1,961 yards. Other teams like Oakland Raiders and San Francisco 49ers had low number of yards while Denver Broncos and Cincinnati Bengals, paid roughly the same amount to their running backs and had more than double the amount of rushing yards than the Raiders and 49ers. 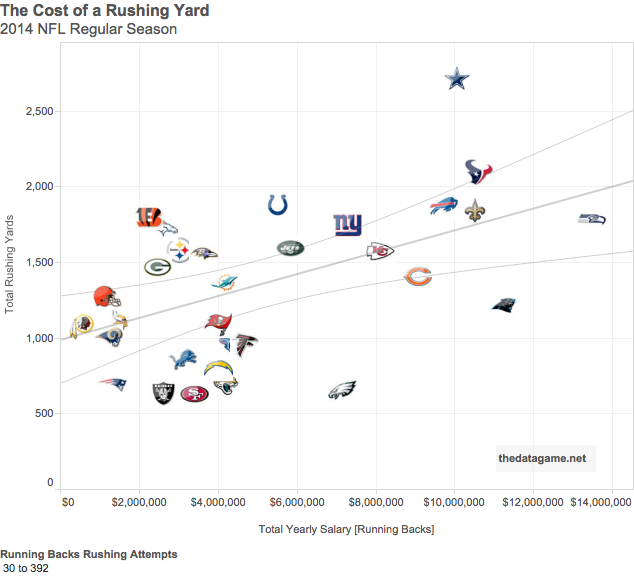 So, teams on the top left of the plot are getting the most for their money while teams on the bottom right have overpaid their running backs, specially the Carolina Panthers which was expected to conquer 1,799 rushing yards for the money paid to their running backs instead of 1,218 yards. Accounting for all teams during the 2014 regular season, the expected price of each rushing yard is $13,814.06. Looking at the relationship salary-yards from another angle, each additional $100,000 worth of running backs salary per year would buy a team 7.2 additional rushing yards during the 2014 regular season (see regression line). Rushing yards data was sourced from NFL running backs stats page and the salaries data sourced from the specialised site Spotrac.com. You are right! I had DeMarco Murray as an Eagles player (2015/16 season). Not as a Cowboy player. Thanks for the heads up. You could basically split the chart into 4 quadrants – cheap and Long, cheap and Short, Exepnsive and Long & Expensive and Short. (1500yds and $7m as the lines maybe).